Public transit buses, taxis and bikers take over the streets on car-free day. Photo by Carlos Felipe Pardo. Bogotá, Colombia, home of TransMilenio and Ciclovia, celebrated the 13th annual “Car-Free Day,” proving that life is possible without cars in a big city. Congestion was slightly relieved and air quality somewhat improved, as it is every year. Some people changed their schedules, and taxi cabs had the best day of the year. Bike parking at some universities were packed, and life continued without much trouble—so little trouble, in fact, that Mayor Gustavo Petro celebrated the “International Day of Wetlands” in the few preserved marshes in the city, rather than discussing the meaning of a day without cars with media, civil society and other experts. Why? Well, 75 percent of Bogotános live without a car 365 days of the year. Car ownership is still very low, as most people travel by foot and public transport. Of course, many people aspire to own a car, but despite the recent growth in car sales, the majority of the population is still car-free. Former Mayor Enrique Peñalosa proposed in 1999 to celebrate a car-free day to prove the city could run without the marvelous machine that changed cities in the 20th century and became the source of many severe problems of city life. This was just one more plan on his ambitious and somewhat successful sustainable transport agenda, which also included thousands of square meters of public spaces, sidewalks and plazas (recovered or newly built); a 300-kilometer bike path network; 42 kilometers of BRT; and a very severe ban on car use—a 40 percent decline during peak hours, restricted according to license plate numbers. Mayor Peñalosa really wanted people to realize that we needed a way out of motorization, and he declared the city’s first car-free day as the first Thursday of the new millennium. Then, he requested the city council to approve a ballot in which Bogotá voters decided to keep a car-free day every year. The ballot process was contested by the Retail Federation (Fenalco), which was concerned that businesses would be affected, quoting figures that were difficult to fact-check. But in a city with low car ownership, less congestion on the streets meant a party for the majority. In that ballot, there was also a request to completely ban the use of cars during the day by 2015, but that proposal did not get enough voters to comply with the balloting rules. 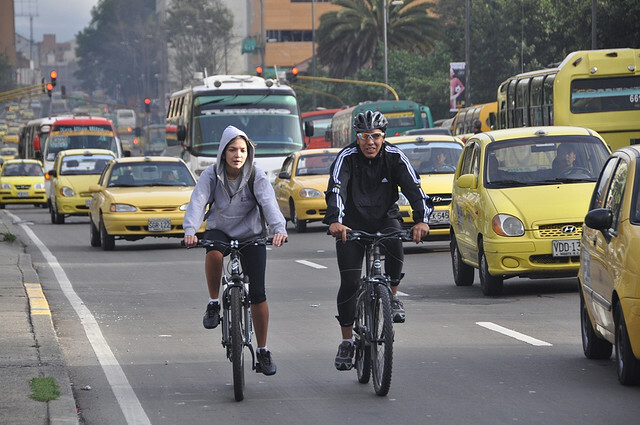 In the end, Bogotá did not get a popular mandate to work towards becoming the first large car-free city in the world. If you want to learn more about car-free cities, go to https://carfree.com/, where you can even get a manual on how to design a car-free city. The internationally recognized progress of Bogotá at the beginning of the last decade under Enrique Peñalosa, followed by Antanas Mockus and Luis E. Garzón, lost all momentum in the last administration by Samuel Moreno, who ended his term short, under corruption allegations. The city grew its vehicle fleet, infrastructure deteriorated, and construction of the new lines of bus rapid transit (BRT) were delayed. A proposed metro is still on the drawing board. Last November, Bogotános elected Gustavo Petro over Enrique Peñalosa by a small margin—32 percent over 27 percent. Gustavo Petro promised a metro, a regional light rail system and an expansion of the BRT. He also suggested the idea of congestion charging to replace the hideous Pico y Placa ban—a congestion mitigation policy that restricts vehicles based on license plate numbers. He also needs to complete the reorganization of all bus services in the city to create an integrated system, which was contracted in the last administration and is expected to change the face of public transport in the city. Today, public transport ridership in Bogotá is split between TransMilenio (26 percent of public transport trips) and disorganized minibuses fighting for passengers on the street (74 percent of public transport trips.) What a challenge! With all of this in mind, the city celebrated the first car-free day of Gustavo Petro’s administration, who announced that the wetlands will be spared the construction of an urban expressway (Avenida Longitudinal de Occidente), and that the land preserved would eventually be used to build schools connected by a light rail. The mayor and his team were invited by Bogotá ¿Como Vamos? to discuss mobility plans in a day without cars. The Mayor did not come, but still, the debate was rich and interesting. Bogotá ¿Cómo Vamos? is an initiative of Fundación Corona and Casa Editorial El Tiempo (a prominent news outlet,) and it has been an observer of every administration since Peñalosa, combining user perception surveys with direct measurements and expert opinion. The debates were moderated by Ernesto Cortés and Yesid Lancheros from El Tiempo newspaper. Conclusions were provided by Claudia Dangond, dean of political science at Pontificia Universidad Javeriana; Alexandra Rodríguez of ¿Bogotá y Concejo Cómo Vamos? ; and Ricardo Montezuma of Fundación Ciudad Humana. Deputy Minister of Transport Felipe Targa, who arrived by bike to the meeting, presented on national policies for urban transport, which include support to mass transit systems and bus reorganizations in large and intermediate cities in the country. He introduced new policies for integrated urban development, the creation of public spaces, value-capture mechanisms and congestion pricing, and new technologies for public transport vehicles—a full “Avoid-Shift-Improve” progressive agenda, with several institutional, financial and technical roadblocks ahead. Being part of an open debate on congestion pricing was reassuring, especially when this discussion used to be off the table. Experts argued in favor of it as a necessary strategy, and council member Flores said he was ready to support it if funding was earmarked for improved public transport. Representative Díaz indicated she did not favor measures that affect the working class, who struggle to own and use a vehicle, but favors value-capture mechanisms instead. Some interesting arguments arose, like the fact the high-income class is paying a high value on pickups or armored vehicles, for which car restrictions do not apply, or that many people have even bought a second car to avoid the ban. Money seems to be available, but it is not going to the city coffers to fund improved public transport. There was also the recognition that users currently pay to use the road in the form of congestion and frustration, not just in tolls. On the question of mechanisms to fund public transport, there was also the general agreement that if cities are to provide good quality services, then subsidies are needed. The concern is where the city may get the necessary funds. Xavier Hoang from AFD presented a study on the topic, with examples from San Francisco (parking), Curitiba (employer payment of transit tickets), Copenhaghen (real estate joint development with transit), Sao Paulo (building rights permits), and Hong Kong (joint development with mass transit), and notes on other good practices. When asked for setting priorities on the city agenda, several participants suggested concentrating efforts on good implementation of the integrated transport system (SITP), and some people indicated that there was an urgent need to improve the quality of the service provided by TransMilenio. Alexandra Rodríguez from Bogotá ¿Cómo Vamos? also called for completing TransMilenio’s Phase III, which has been under construction for five years with still some time away from operations, and a more defined future of Carrera 7a, a BRT-turned-light-rail project, without a clear path. In summary, many proposals were brought to the table. Local authorities may read them in the media, as they were not in the room.